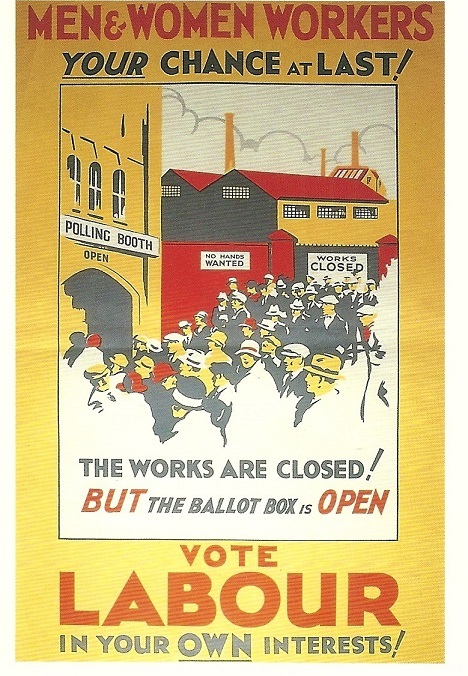 A series of Classic UK Election posters, which I recently received as a kind gift as a pack of ten postcards. Are similar Irish ones available for sale I wonder? 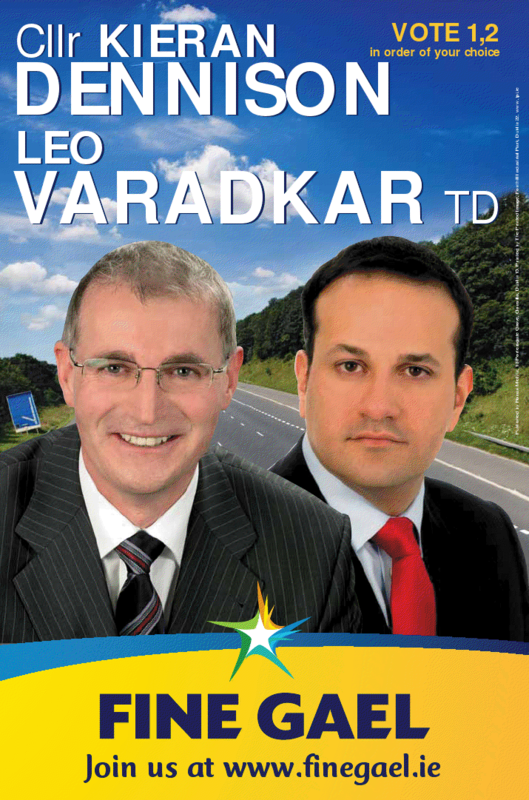 From the 2011 General Election a set of posters for Fine Gael candidates in Dublin West Kieran Dennison and Leo Varadkar. Varadkar was elected. For those of you wishing to print larger versions of the posters for your walls I’ve uploaded it in pdf form too. 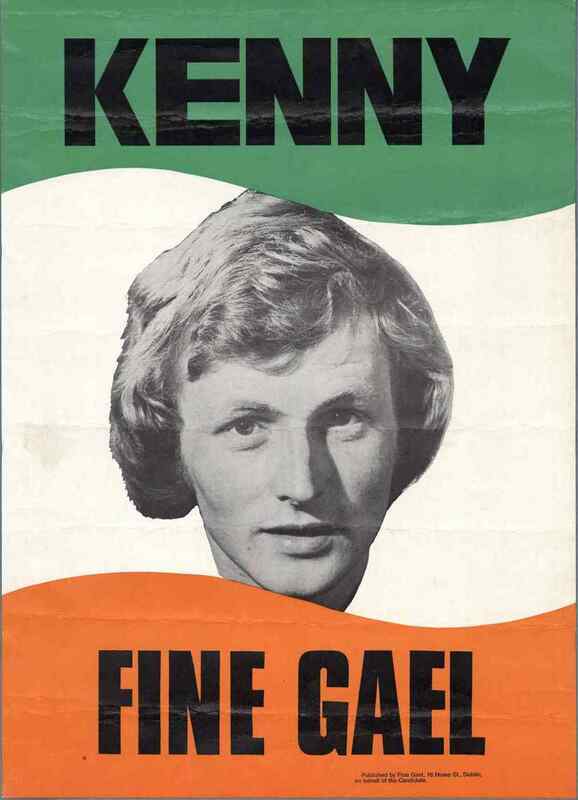 From the 1975 Mayo West By-Election, caused by the death of his father Henry Kenny , a poster for now Taoiseach Enda Kenny. He was elected on the first count. I’d previously posted a tiny version of this ….. Via the Limerick City Museum Site …. 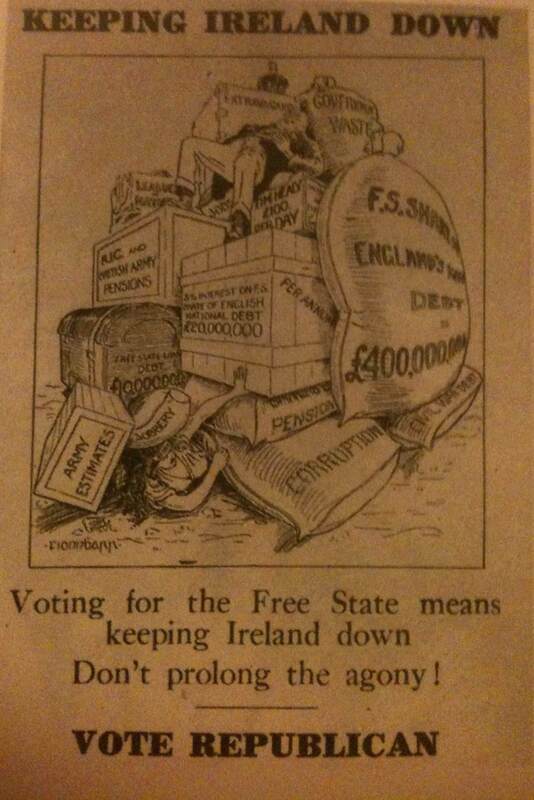 (credit to Brian Hodkinson, Museum Curator) , a wonderful 1917 East Clare bye election poster for Eamon De Valera. Which? 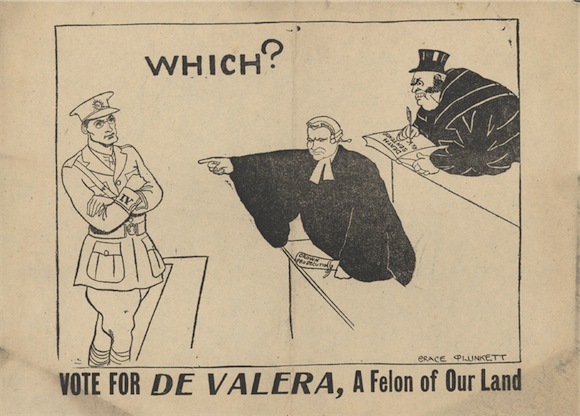 Vote for de Valera, a Felon of our land.The two candidates in the 1917 East Clare bye election depicted as prisoner and prosecutor. de Valera in Volunteer uniform, stands in the dock as prosecutor Lynch points to him while a judge in a top hat writes out a death sentence. Printed on one side only. “…designed to counter Fianna Fáil protests at the amount of money being paid out as military pensions to ex-members of the National Army. 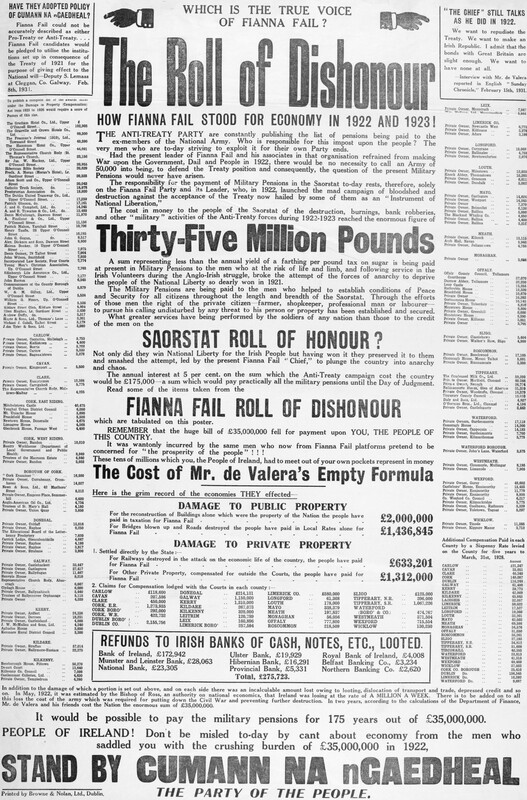 In response, the text of this poster roundly condemns Fianna Fáil for causing the Irish Civil War, a conflict that cost the Saorstát “Thirty-Five Million Pounds”. 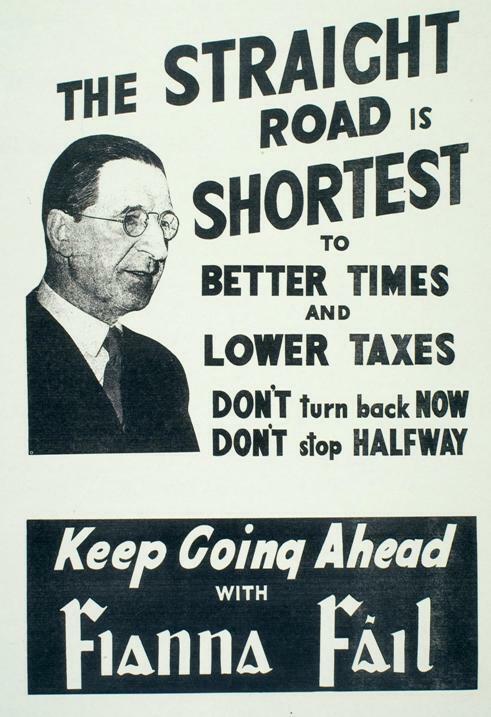 Three vintage election posters from Fianna Fail. 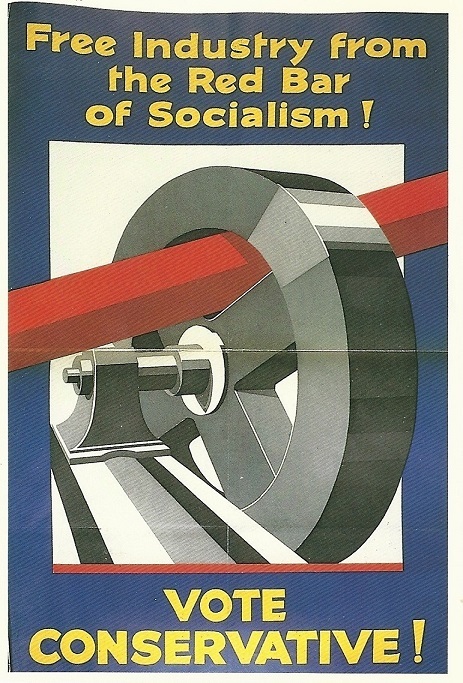 “The Straight Road is Shortest”,”Keep The Wheels Moving” and “Fianna Fail is Building Up”. I’m not quite sure which elections they are from, either way they are a reminder of different times.